Sunrise on the Sunday morning wasn’t much to write home about, mainly because I’d forgotten to set my alarm, so I slept through the whole thing. This annoyed me somewhat, until I looked out the window and saw the glowering clouds and dismal, hazy drizzle that peppered the window. So, pleased I hadn’t missed much, I got my stuff together and headed out to Swanage seafront in case things brightened up a bit, plus I was up, so I felt as if I should do something. Apart from a couple of dog walkers I had the beach to myself at such an early hour, so I wandered along the blustery shore looking for something to catch my eye, and waited for the soupy spray to abate. Settling on one of the many groynes that jut solidly into the ocean, I took a few shots as the sea came scurrying in around me. Not wanting to give that mischievous minx an opportunity to breach the tide line of my boots though, I didn’t venture too far into the briny swell. I had to pack up and leave that morning, so wet jeans weren’t an attractive proposition. 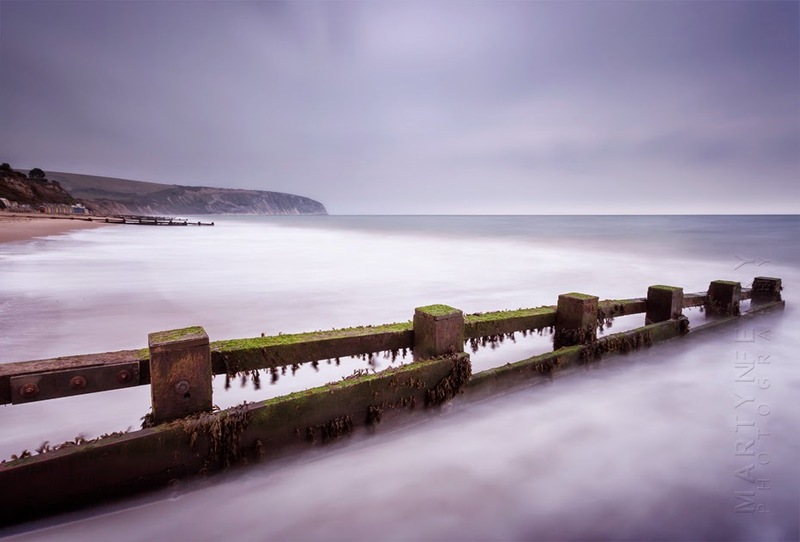 A few long exposure shots of the sturdy groynes as they are battered by the elements. Partly due to the raw conditions, I was soon out of inspiration and ready to head back to the apartment, plus, like a cheaply made electronic toy on Christmas morning, my hands had stopped responding to my commands in any useful manner. The sharp, icy winds that constantly badgered me were taking their toll, and any thoughts I had of continuing my seaside meanderings were soon put to rest. After packing up and checking out I made a quick journey over to the duo of piers that run out from Swanage’s southern end. No visit to the town is complete without a few shots of the ever photogenic old pier, and this trip was to be no exception. After paying the small entrance fee and setting myself up on a secluded section of the new pier I began snapping away under a scowling sky. Thankfully it was too early in the season for the grey panelled dive platforms, which are used throughout the summer months, to be deployed along the edge of the new pier, so the view to the remnants of the old structure was uninterrupted. The term new pier is somewhat of a misnomer, it was first opened to traffic in 1897, although it fell into dereliction later years, it's refurbishment began in 1994 when funds were raised via the local community, the National Lottery and English Heritage. the right, a collection of seaside residences on the Peveril Point headland. 96 miles later at Orcombe Point near Exmouth. After I’d amused myself for a while with panoramic shots and long exposures, I wandered up to the end of the pier and took advantage of the fact I had the place to myself, which is unusual. I spent a bit of time getting a few shots of the shelter that, like a skipper’s hat on a venerable old seadog, caps off the promenade as it steadfastly weathers the salty breeze. money to help with the restoration of the pier. With mid-day fast approaching, and neither the skin shredding winds nor expansive gloom showing any signs of retreat, I decided that it was time that Dorset and I part ways, so I strolled back to the car and buggered off.